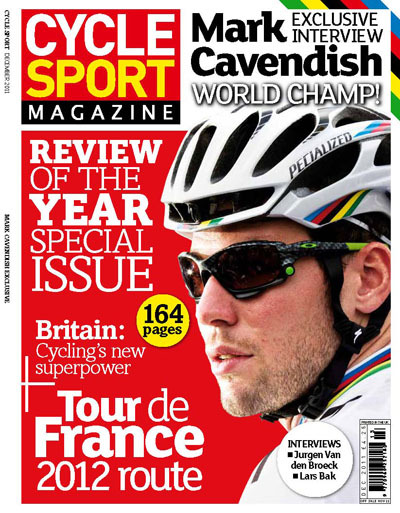 Cycle Sport December, featuring our review of the year and an exclusive interview and photo shoot with new world champion Mark Cavendish, is out now. 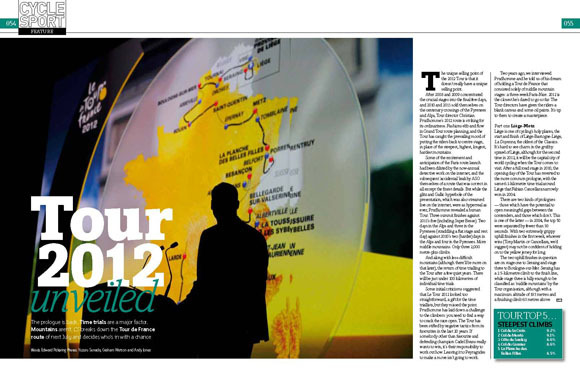 This month’s magazine also features an in-depth look at the recently-announced 2012 Tour de France route, plus local resident Maxime Monfort shows us round the Liège prologue route. 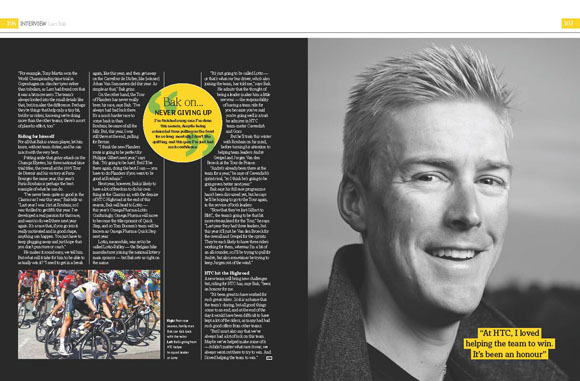 There are interviews with Belgium’s best grand tour rider for 20 years, Jurgen Van den Broeck, our domestique of the year, the indefatigable Lars Bak, plus reports from the Tour of Beijing, a picture special from the world championships, and a look at how Great Britain have emerged as a cycling superpower. It’s 164 pages of the best writing and photography of professional cycling, incisive banter and sharp analysis. Few cyclists ever transcend the sport to become internationally-renowned athletes, known and admired by the wider public. The last was Lance Armstrong, but Mark Cavendish is fast becoming one of the worlds most famous and marketable sportsmen. Cavendish added another memorable achievement to his incredible string of results when he won the world road race championships in Denmark last month. 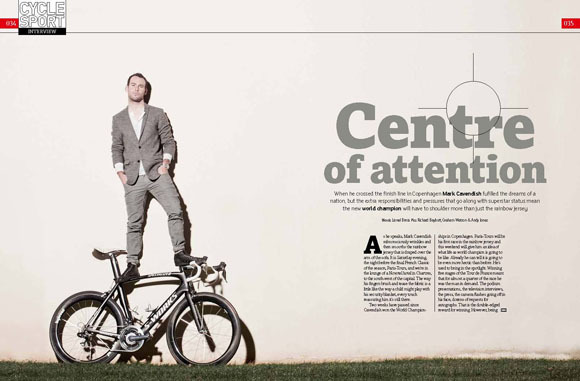 Lionel Birnie interviewed Cavendish on the eve of his first race in the rainbow jersey, Paris-Tours, while Richard Baybutt shot an unforgettable portrait of the sprinter, which appears on the opening spread of the feature. Cavendish explained what the rainbow bands meant to him, and revealed more details about the long-term plan, plus the race-day tactics, which won him the worlds. Cavendish is now a man in even more demand than before. He’s won a classic, the worlds, and almost an entire Tour de France’s-worth of stages in just four years. But with the results and riches come relentless pressure and attention, and our feature also looks at the way Cavendish must now deal with the public, the autograph hunters, the well-wishers and the press. Britain’s first world champion since Tom Simpson is not just a cyclist any more, he’s negotiating the line between his private life and being public property. 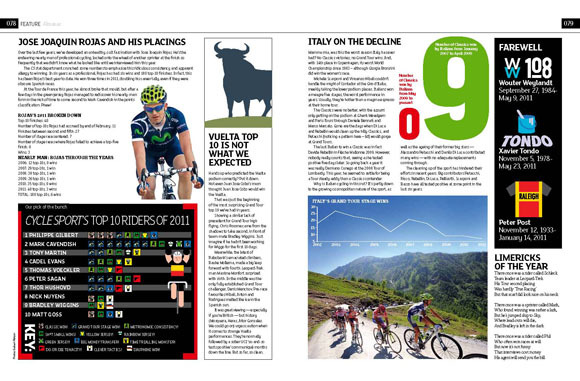 Our unique Almanac of 2011 presents the year in cycling through the stories that dominated the news, taking you through the excitement of the spring classics, through the tragedy-struck Giro and slow-burning Tour de France, then the Brit-dominated autumn, all the way to the surprise winners of the final classics of the year. There are expert panels from our own writers plus a couple of special guests, statistics, analysis, praise, criticism, highs, lows, head-to-heads, graphics and even limericks. Which rider has won a race a year since 1996? Who is Cycle Sport’s top rider of 2011? How many top 10s did cult hero José Joaquin Rojas get this year? Which country doesn’t win as many races as it used to? How many races would BMC have won this year if their 2012 squad had all represented them this year? Why was the Giro so dull? Which country, pound for pound, is the strongest cycling nation in the world? What was so good about the classics and Tour de France? Is Johan Van Summeren the tallest ever Classics winner? Which team won the most stage race classifications? Why did ASO make such a pig’s ear of the Paris-Nice route design? Which was the last WorldTour team to actually win a WorldTour race this season? Which rider had the longest season? 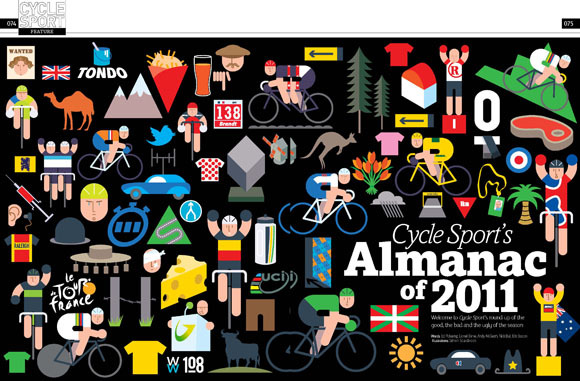 All these questions, and many more, are answered in Cycle Sport’s Almanac of 2011. 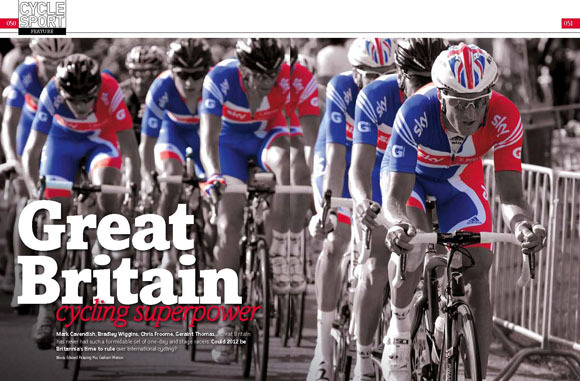 Is it too early to start talking of Great Britain as a cycling superpower? In 2005, British riders won four races in the entire year – all minor events. By 2009, they had improved enough to win 32 in a single season. Added to that, Mark Cavendish has dominated the Tour sprints in the last four years, and Bradley Wiggins and Chris Froome have emerged as grand tour and stage race contenders, maybe even Tour de France favourites. Our feature looks at the development of British cycling in the last decade, and identifies the final piece in the jigsaw: the Tour de France. If there isn’t an officially-announced Project Yellow Jersey, you can bet that David Brailsford and Sky are working on it in all but name. The 2012 Tour de France route was leaked, then officially announced, to fears that time triallists would be favoured by the less mountainous parcours. We’ve looked at the route, and while the time triallists have plenty in their favour, we also find that organiser Christian Prudhomme is throwing down a challenge to the climbers: you find a way to get time back from the rouleurs. With a series of new climbs, more stages in the middle mountains, but also with a couple of classic mountain stages, the 2012 Tour has territory for ambitious climbers, but they must try something new if they want to win the yellow jersey. Modern tactics are conservative, demonstrated by this year’s Tour, where the climbers spent two days in the Pyrenees watching each other carefully and leaving everything to the Alps. If they try that in 2012, they’ll have handed the race to the stronger time triallists, inluding defending champion Cadel Evans. Jurgen Van den Broeck is one of the riders who can consider themselves to be strong contenders for the yellow jersey at the Tour. The Belgian was fifth in 2010, then crashed out of the 2011 race in the Massif Central, while well in contention overall. Van den Broeck explains to Gregor Brown the frustrations of having to sit out the second half of the race, with serious injuries (he broke two ribs and a shoulder, and punctured a lung) and the pain of recovery, tempered by satisfaction at still coming back in time to finish eighth at the Vuelta. Who is the best domestique in the world? 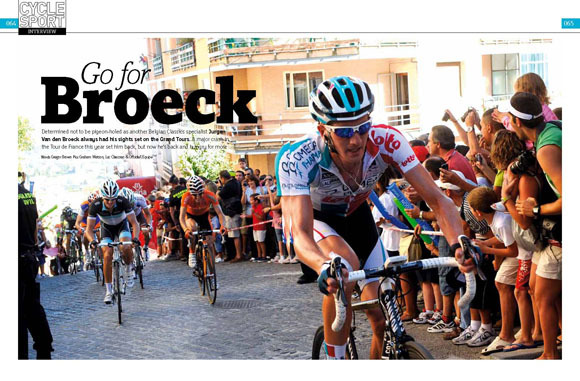 By our reckoning, HTC rider Lars Bak has a strong case. He supported team mates to wins more times than any other rider in 2011, contributing to 20 victories in total. Bak talked to Ellis Bacon about how he has adapted his strengths to becoming the ultimate team rider, but with his transfer to Lotto in 2012, he’ll have an opportunity to have others ride for him. Bak was fifth in Paris-Roubaix this year, and he tells us his ambitions aren’t just for his team-mates. Cycling is a rapidly-changing sport, which has one foot in the old cycling world and one in the new, and we have reflected that with two features, one covering a traditional, well-established event and the other looking at a new race in unusual new territory. 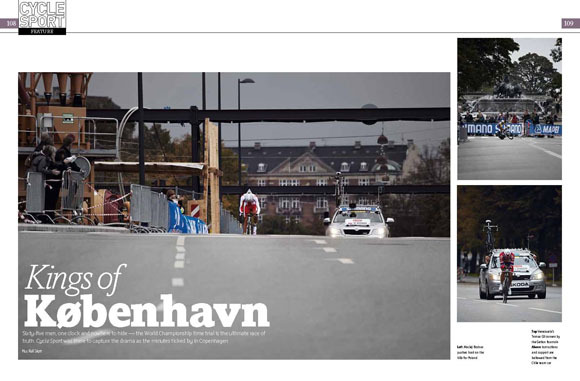 We sent photographer Kell Skott to Copenhagen to cover the world time trial championships. The result was an incredible series of pictures, in which the urban landscape of the city provided a unique backdrop for the colourful, fast-moving cyclists. 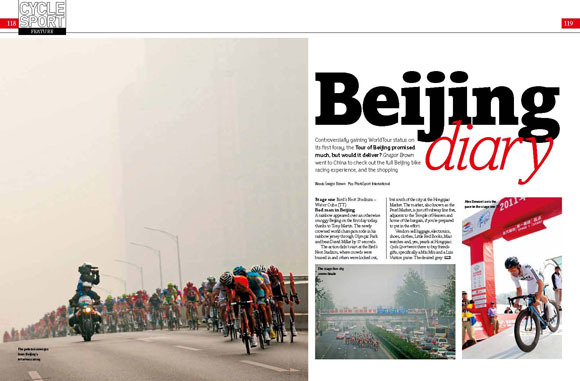 Meanwhile Gregor Brown went to the Tour of Beijing, and sent us a colourful diary of the five-day race, looking at the event itself, but also going behind the scenes and looking at the clash of cultures between China and the circus of the WorldTour. For most riders, the Tour de France starting in their home city is a dream. Next year, Maxime Monfort has the chance to live that dream as the Tour kicks off in Liège. The Belgian rider braved the inclement weather and showed Andy McGrath around the grimy, industrial city, taking him round the prologue route, but also identifying the best cafes, nightliife and cycling territory for your visit next year. Iconic Places visits one of the Tour de France’s most illustrious summit finishes, Pla d’Adet. Described by former Tour winner Lucien Van Impe as the “hardest climb in the Pyrenees,” Pla d’Adet has appeared nine times as a stage finish, more than any other summit finish except for Alpe d’Huez and Puy de Dôme. It last appeared in 2005, but another visit is overdue. Plus…	All our regular features – Graham Watson selects his best pictures of the year; Shop Window showcases another selection of extravagant professional kit; Broomwagon announces a new sitcom for 2012: McQuaid’s is set in an Irish bar in Switzerland; Any Questions with Alex Dowsett; Top 10 weird transfers; Geraint Thomas on Cavendish’s win, and much much more. Warning: Cycle Sport December is so good, you’re not going to get anything constructive done around the house while you’re engrossed in its excellent journalism, fantastic writing and superb photography. It’s on sale right now in the UK for the recession-busting price of £4.25, and later in the USA.